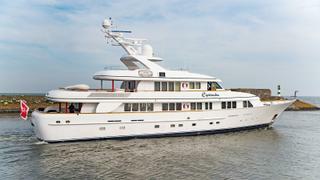 The 40 metre Feadship motor yacht Seaflower has been relaunched in Makkum bearing the new name Cipitouba. 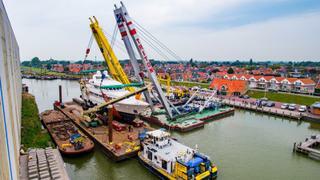 The Dutch yard revealed that work began in September 2016 and lasted nine months. Key upgrades included new generators, exhaust gas filters, a new electrical power management system and a new alarm and monitoring system. Elsewhere, the main-deck saloon, dining room and bridge deck lounge were all given a complete makeover, while the marble in the guest bathrooms was replaced. Cipitouba was reunited with her owners last month, following the completion of her 15-year Lloyd’s class survey. Designed by De Voogt Naval Architects, Cipitouba was launched in 2002 with interiors by Larvor. She can accommodate up to ten guests and seven crewmembers. Key features include a walk-around main deck and superyacht sundeck that is partially shaded by a hardtop bimini. Power comes from a pair of 671hp Caterpillar 3412B-DITA engines that draw on a total fuel capacity of 17,600 litres. This combination should ensure Cipitouba is capable of extended coastal trips at her cruising speed of 13 knots. Her vital statistics include a beam of 8.95 metres and a maximum draught of 2.75 metres. Cipitouba is the fourth Feadship refit project to be completed this year, following on from the relaunches of the 49.99 metre Aurora B, the 47.49 metre Tatasu and the newly lengthened 68.77 metre Drizzle. The latter completed an extensive refit at Barcelona’s MB92 back in May and members of the Feadship team collaborated with the Spanish yard on her new paintjob, sundeck gym area, and 1.5 metre bathing platform extension.